ZOMBIE CATS EATING PLANTS! : Spay Day! The second Sunday of every month in Tampa is ACT's Spay Day. This is where with an appointment, caretakers can bring in feral/stray cats and kittens in humane traps to the Animal Coalition of Tampa (ACT), to get them spayed/neutered, vaccinated, checked out for other health issues, given flea medicine, de-worming medicine, and ear-tipped as part of the TNR program (Trap-Neuter-Return), all for only $10. 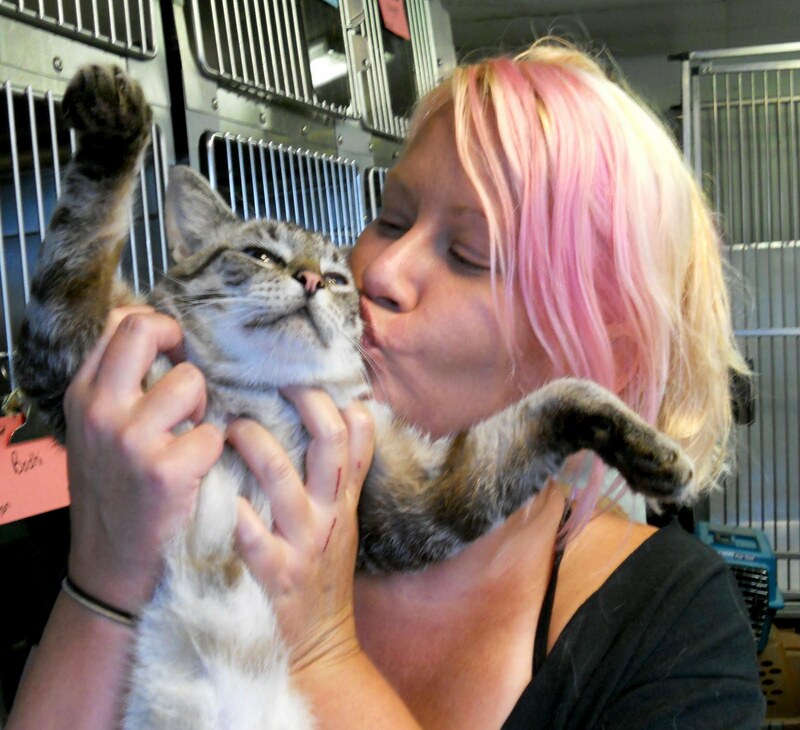 Each month around 100 cats are spayed/neutered on this day. ACT's Spay Day is made possible by grants and many volunteers, including the awesome Veterinarians who volunteer their time to do hundreds of surgeries for these poor homeless cats. ACT also excepts feral/stray cats Monday-Saturday without an appointment for spay/neuter surgeries and ear tipping for a discounted rate of $25 per cat. Bright and early the cats arrive in traps. One by one they make there way through the back door and to the first station. Since these are feral cats and usually not friendly, they have to be given a shot of anesthesia why still in the trap. A fork is used to confine them to one side so as not to hurt the cat. This is for the safety of the volunteers as well as the cats. About a minute later they are out like a light. This is when the cats are taken from the trap and put on the table for inspection, tagging, and a shot of penicillin. Even though he looks awake, Mr. Kitty is out cold. Big Orange looks so happy while he is under. I love his little mouth freckles. My friend Olya holding Big Orange. He looks like he is awake, but is not or he would tear her face off. We gave him lots of hugs and kisses while he was out. Every cat deserves some lovin... even if it is while under anesthesia. This guy is from my hood too. He is actually friendly, so wouldn't mind my kisses. It very sad that he doesn't have a home, and since he is friendly he was likely thrown out. :( Finding friendly cats outside that want a loving home is the hardest part of being a TNR volunteer, but it's also why it is sooo necessary that we spay/neuter as many as we can. With every Spay Day comes kittens... lots and lots of kittens! Unfortunately with so many kittens being born daily on the streets, there is not enough room for all of them in rescues and at no-kill shelters. :( Many of the kittens brought in on Spay Day have to be released back outside like the adults, but there is a program called the Street Kitten Program, where 15 friendly, healthy kittens are placed with St. Francis Rescue Group each month. This is arranged by appointment only, and there usually is a long waiting list to be considered for this program. The "Street Kittens" arrive in carriers and are given shots of anesthesia while being held since they are friendly. They then go through the same process as the rest of the cats with the exception of not being ear-tipped and they get a few extras since they are going up for adoption. Here is Olya putting some drops in the kittens eyes. This is done to all of the cats, it keeps their eyes from drying out during the surgery. Here is an example of the tag that each cat receives at our station. We rescued her off the side of the interstate overpass. It was a bad situation and we have no idea how long she was there, but luckily she went right into the trap for food, and is friendly. There was no room fro her in the Street Kitten Program, so but luckily she was recently adopted out through the Humane Society of Tampa Bay. This is Tiggie! aka. Kitten Face! I rescued her from Hillsborough County Animal Services along with her brothers when they were only 1 week old. I just happened to be up there when a lady brought them up in a box, she said they found them under a truck with no momma. I took her and her brothers and paired them up with a nursing mom and my friend Candace fostered them. Ear-tipping is a process where about 1/4 inch of the tip of one ear is removed while the cat is under anesthesia. This is the universal sign of an altered feral cat. It lets feral cat trappers such as myself know that they have already been spayed/neutered, that way they are not trapped again and put through the process of being sliced open to only find that they have already been spayed. It is also a potential lifesaver if the cat ever gets brought in to Animal Services. Many counties, including mine let feral colony caretakers know of any ear-tip cat that shows up so we have the option of rescuing them and taking them back to their colony. Here are some females with shaved bellies waiting their turns for spay surgeries. Female going in for surgery. Thank you so much for donating your time! It's much easier to neuter than it is to spay, for both the doctor and the cat. Female coming out of surgery and on her way to recovery. Nursing moms getting extra fluids after their surgeries. After all is said and done, the cats are placed back into their traps and are ready for their caretakers to come pick them up. This is my crew in traps recovering after surgery. I leave my ferals in traps for no less than 24 hours so they can recover. I change the paper daily and provide food and water in the traps. This is the safest way of recovering a feral cat for both the caretaker and the cat, as most feral cats are not friendly, but still need time to recover. He was not a happy camper once he woke up. He was even less happy. But I'm happy to report that he is back to himself roaming my hood without making babies. This is the friendly boy in my neighborhood. He is doing great but I really wish I could find him a proper home. I didn't get good pictures of the other cats I brought in, but I had 6 total adults and Tiggie the kitten on this Spay Day. That concludes Spay Day as documented by me. I didn't take the greatest pictures, but I'm not a morning person and Spay Day is super duper early. But I hope you now have an idea of what goes on behind the scenes. It's basically like a kitty assembling line with about 100 cats and tons of volunteers. It's pretty amazing to see in action. Hopefully this will encourage you to get active in your local TNR (Trap-Neuter-Return) Program. contact Alley Cat Allies, your local shelters, or google TNR or low cost spay/neuter with your city and state. There is no such thing as a "responsible breeder"! Every animal BRED = another animal DEAD! You're awesome! I love hearing about things like this. These pictures are unlike any I've ever seen. I like the ones where you and Oyla are givning them some lovin'! That is something I would do! Wow!!! What an amazing program. There are a few kitties around my neighborhood that could use this. You must feel so good about volunteering for such an amazing organization. Great photos!! it's such a sad shame how many feral cats there are in each city. But it is hopeful to see that people still care and reach out to them. Loved this post! I agree, it's great learning about and seeing what goes on behind the scenes! I think it is so cool that you guys have something like this...what an awesome thing! Loved all the pics! Thanks for sharing. I'm getting ready to trap four feral kittens at my place of work. I think I have a home for one of them so far. They are beautiful kittens and I'm hoping to find homes for the other three. I do hate the ear tipping part, but I understand why. The Critter Place NEEDS YOUR HELP!